What’s a hero? One we wrote about the last two weeks is Captain Curtis Laird of Dayton, who risked his life for others every day as a helicopter pilot in Vietnam. Another is a twenty-something young man from Germany whose anonymously donated bone marrow saved our grandson’s life. And this discussion can’t go on without the mention of Captain Ken DeFoor of the Liberty County Sheriff’s Department, who will never retire from helping others. The man has a heart of gold. There’s also Captain Tammy Jo Shults, the Southwest Airlines captain who safely landed a crippled and severely damaged airplane last year. Three things Captain Shults emphasizes when she shares her story of flight 1380 are habits, hope, and heroes. First, if we practice good habits then in an emergency, those habits will be automatic at the time most needed. Second, hope doesn’t change our circumstances, but it does change us. Third, there’s no need for titles or props for one to be a hero. She recounted opening the cockpit door after landing the plane, expecting to see frightened passengers and chaos in the cabin. To her surprise, everyone was calm, and people were helping each other. The flight attendants were heroes that day, helping and reassuring everyone, and creating a safe atmosphere so emergency responders could do their jobs. One passenger bent down to tie the shoes of another who was unable to do it themselves. We know about this because that person is one who Captain Shults calls a hero. While the captain indeed saved many lives that day, she is quick to say that there were many heroes that day. Her definition of a hero is someone who takes time to be selfless and help others. And that is exactly what we witnessed last week when Liberty Police Department Officer J. Rodriguez was driving through our neighborhood and stopped his car, got out, and walked up the driveway to help our neighbor who is mobility-challenged get into her vehicle. Officer Rodriguez didn’t have to do that. This wasn’t a life-or-death situation. It was one most people would have ignored—and do every day. And it’s probably not in his job description. But people like him don’t live by job descriptions. They live by their convictions. They aren’t looking for recognition, and attention is not what motivates them. In fact, these are the kind of people who don’t even want the spotlight. They just want to do what’s right. Although our column is mostly about aviation, this week’s piece for Ely Air Lines was prompted by the actions of Officer J. Rodriguez. Heroes can be found in the sky, at sea, and on the ground. And there are opportunities to be a hero every day. So, let’s take our cue from their examples. Here’s to the Curtis Lairds of the world, the Ken Defoors of every community, the Tammy Jo Shultses across the jet stream, and the J. Rodriguezes of every small town. We need more like you. We’re back this week with Curtis Laird, who has stories about more than just bullets and hairy spiders from his time in Vietnam. Even cargo nets can cause problems. Captain Laird had transitioned from flying CH-34’s to flying the Sky Crane, an amazing helicopter that looks like a giant wasp with its head down. On November 15, 1968, a cargo net hanging from a Sky Crane he was flying broke. No one realized the material had rotted. Snapping in the air caused the hook, which was attached to the net from a cable off the Crane, to bounce up and hit a hydraulic line. Laird landed the Crane, and the crew carefully inspected the aircraft for damage. They thought it was okay, so he lifted off again. Soon after, they heard an explosion in the cockpit. He remembers asking his co-pilot and flight engineer, “Are you guys okay?” He checked the gauges. Then he noticed it. Right by his co-pilot’s foot was a hole the size of a football in the floor of the chopper. His military facility directory, half an inch thick, also had a hole—pierced by shrapnel. The sniper must have been close. They were lucky they weren’t shot. Laird’s concern turned to the nose gear. Another time, he landed his Sky Crane at Plieku Air Base for the evening. He was hungry, but the air base mess hall was closed, and Camp Holloway was five kilometers away—a dangerous five kilometers. No one wanted to travel that road. But one fellow serviceman volunteered. He drove bravely in a Jeep—probably the fastest he ever drove that Jeep. When Laird arrived at the camp, he wolfed down a sandwich. Then he looked “over yonder” and saw Madison Powell from Dayton standing in the canteen. He was there to check some Air Force guys out in the C7A Caribous that were being transferred to the Air Force. Like others, Captain Laird was often shot at or shot up on missions in Vietnam. He was awarded the Air Medal with V device and 22 Oak Leaf clusters, the Bronze Star, and numerous other medals. He is one of Dayton’s heroes. Mike: Dayton High School graduate Curtis Laird grew up in an oil field camp west of town. He’s a member of the Sons of American Revolution and Sons of Republic of Texas. For thirteen years, he was the American Legion Post Commander. He served on the appraisal district and was the chairman of Dayton city planning. He also did two tours in Vietnam. When Laird joined the army in 1958, helicopter pilots were in demand. Fort Benning, Georgia would be his home during training in the 174th Aviation Company. After training, the 174th stepped into an old Lockheed Electra L-188 and were flown to the west coast where they boarded the military sea transport ship, the USNS Upshur. Twenty-three days later, the ship dropped anchor in Qui Nhon Harbor on the central coast of Vietnam. They’d spend one more night on the Upshur, protected by grenades the MPs dropped in the water in a perimeter to discourage the enemy from sticking magnetic mines to the boat’s hull. The following morning, the soldiers climbed down rope ladders to a landing craft that took them ashore, where they boarded buses for the fourteen-kilometer trip to their new home, Lane Army Airfield. A few days later, the company’s sixteen UH-1-D Hueys arrived on a carrier. The ship’s captain was understandably eager to return to deep water before dark, so he asked the pilots to get the choppers off his deck ASAP. These circumstances caused Laird’s first flight in Vietnam to culminate in landing in the profoundly somber darkness of night. Linda: But dodging bullets while flying resupply and assault missions wasn’t the only danger. The 161st also supported the heavy weapons unit, performing harassment and interdiction (H&I) missions using 155-mm Howitzers. Welcome to Vietnam, sleep well. Of the more than 314 million people in the United States, 49 per cent start their day with a bowl of cereal. This results in 2.7 billion boxes sold every year—enough to wrap around the earth thirteen times. But what would lure serial aviation columnists to this topic you ask? It all started with stripes. When we learned there was turbulence over the meaning of stripes, we decided to save the world from such confusing flap. For background, you should know that Cap’n Crunch’s full name is Horatio Magellan Crunch and he was born on Crunch Island in the Sea of Milk. As we continued to dig deeper into the breakfast bowl, we discovered that the astronauts from Apollo 11 boosted their brain power while in space with a cereal breakfast. The cereal was mixed with fruit and pressed into cubes since the lack of gravity kept them from pouring it into a bowl with milk. Further out to the edge cases, we learned that when Kix cereal issued its atomic energy-inspired Lone Ranger ring in 1947, the ring contained trace amounts of radioactive polonium, which glowed. Sadly, the material inside the rings had a short shelf life and none in existence work today, so we hear. But back to the stripes. What you see in career pilot attire these days was introduced by PanAmerican Airways in the early 1930s. Before then, typical dress was World War I military style. That is, a comfortable shirt, khaki pants, black boots, silk scarves, and of course, the leather bomber jacket. When PanAm began flying South American routes in their Sikorsky S-38 and S-40 flying boats, management thought it would help passengers if their pilots looked more like sea skippers familiar with water vessels. That’s when pilot uniforms took the plunge to more closely resemble that of Naval officers, as they flew the American Clipper, Southern Clipper, and Caribbean Clipper. PanAm’s great success caused others to follow suit, spoonful by spoonful. In today’s industry standard, we see officer-style caps with gold or silver insignia depicting the airline’s name or logo, black trousers, and black double-breasted blazers with braided loops on the lower sleeves denoting crew member rank. Four stripes on the shoulder epaulets and blazer arms are worn by the captain. Three stripes tells you that’s the first officer. On today’s passenger flights, two stripes typically means the person is a flight attendant. While we know what to look for on each other, the dress code is often lost on the non-flying general public. But now Gazette readers are wiser than the average passenger bearing the weight of uniform ignorance. 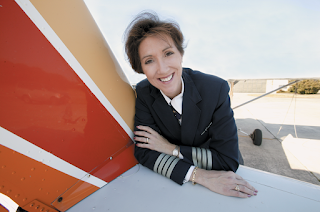 Linda: Networking was in the conceptual spotlight at the annual Women in Aviation International conference in Long Beach, California this month. I was honored to be invited as a panelist on the Careers in Business Aviation panel, which I shared with five other female aviation professionals. It really does boil down to who you know. However, success in that assumes one will work hard, be dependable, honest, and passionate. That passion and dedication could be seen in the keynote speakers. One was Gwynne Shotwell, President and Chief Operating Officer at SpaceX. According to Forbes, she is one of the most powerful women in the world. Yes, she wants to go to Mars (and come back), but more important, she wants her vision and that of her boss Elon Musk to be fulfilled—to Mars and beyond. The other keynote speaker was Captain Tammie Jo Schults, the pilot who landed her Southwest Airlines 737, flight 1380, safely in Philadelphia after violently losing an engine. Captain Schults grew up on a ranch in New Mexico and dreamed of flying. Her family’s hay barn was a ground reference point for pilots from nearby Holloman Air Force base practicing aerial dogfights. If you heard the tape of the radio transmission, you may recall how calm she was during the crisis. She had been a naval aviator, flying F-18s. She’d been under pressure at altitude before. As she walked us through the tense moments that occurred April 17, 2018, the audience of 4,500 held its collective breath, even though we knew the outcome. From 32,500 feet, they felt like they’d been hit by a truck. The airplane began skidding, rolling to the left, and pitching down. Their eyes couldn’t focus due to the severe shuddering of the airframe. Smoke came into the cockpit through the air conditioning system, making it hard to breathe or see. A window broke and this caused rapid decompression of air pressure which caused piercing pain in their ears. They began an emergency descent. The noise of wind while traveling 500 miles an hour was deafening. Through it all, Captain Schults and First Officer Darren Ellisor flew the plane. The captain relayed to flight attendants that they were not going down, they were going to Philly. Captain Schults is quick to state that aircraft are flown by crews, and crews have names. She named each one, as well as passengers who helped each other during the frightening time. But for the crew, the survival of most will never eclipse the loss of one. Here were our take-aways: habits are formed from practice. When an emergency happens, our habits kick in. Hope does not change circumstances, but it does change us. And heroes. Every day, we have a chance to be a hero to someone. Linda: Last week we told you about Jerry Phan’s training in formation flying, which he bravely used to save a pilot and passengers one night when the worried pilot wasn’t sure whether his landing gear was working. That’s not all. Jerry lives for the opportunity to help. He flies Angel Flights, using his own airplane to take people for medical care when the drive is too far, and flying on an airliner poses too much risk of infection. He also works with FEMA. After Hurricane Harvey, he was the team leader for a language team and flew here to help Vietnamese Houstonians tread the murky waters of rescue and shelter. He engineered a plan for private flights and trucks to deliver supplies and created staging areas. Jerry loves to make people smile and laugh in their toughest times. But he clarified something for me. He doesn’t actually work for FEMA. He takes time off work to volunteer. Jerry designs and builds characters for TV and movies. I wondered, did he mean real live humans, or anime? No, he explained. Jim Henson Muppets. Chewbacca is one of his designs, but he works on all of them. The Sesame Street Muppets are serviced regularly. Extra body parts are salvaged so new Muppets can be made quickly. Many Kermits and several Miss Piggys are built for any given scene. “Because,” Jerry explained, “you can’t stop filming to clean a Muppet.” They do get dirty, like when Oscar the Grouch surprises his co-stars with slime. 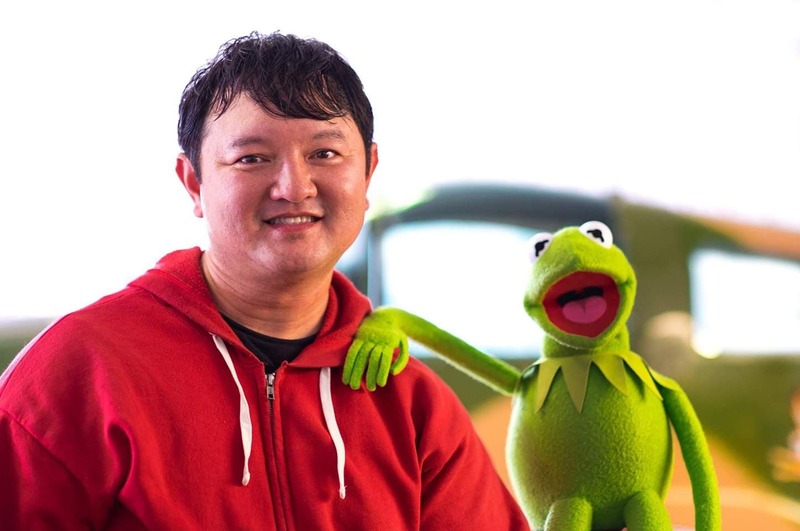 Jerry Phan and Kermit the Frog, Jim Henson Muppets. On his way home from a fly-in, a pilot encountered another aircraft in trouble. It was full of passengers, circling, and low on fuel. Here is their story. On July 9, 2016 at 9:38 pm, from the skies above Los Angeles came a distress call to SoCal Approach, the air traffic controllers who manage that busy airspace. A pilot flying a Diamond Twin Star had declared an emergency. Gear lights in the cockpit indicated the landing gear had failed to come down. The pilot circled above the El Monte airport considering his options. Had the extension system failed, or were the indicators malfunctioning? The controller noticed nearby traffic on her radar but assumed it was too dark for anyone in the passing aircraft to see whether the gear was down. Out of the darkness came a voice. “El Monte area traffic, this is Katana, I am about three miles north of the airport. I can take a look at that aircraft. I am formation trained.” The pilot of the single-engine Katana had special training in flying close to other aircraft. He instructed the Twin Star pilot. “Circle over the airport. Try to stay at pattern altitude and I’ll join on you.” He’d stay 300’ above the distressed aircraft until he could see it. Once in sight, he verified its airspeed before closing in—80 knots. “Slow down and make a fifteen-degree bank to the left.” The Twin Star slowed to 73. “You’re off my nine o’clock now. I’m gonna begin my join, okay?” Katana advised him to continue the shallow turn. Unexpected variations in speed, altitude and turning could be disastrous. It was so dark, he needed to get a few feet closer, but the Twin Star was now at 82. From the unstable flying, he sensed the other pilot’s nervousness. “What’s your name, bud?” he asked. Anthony was happy for the help. “Thank you, Jerry,” he said. Meanwhile, his daughters were on the ground, worried, as they listened through hand-held radios. “I don’t know how to thank you!” exclaimed a very relieved Anthony. Linda: What a fun name for a dude ranch—Happy Bottom Riding Club. You might have seen the popular guest ranch featured in the movie (and the book), The Right Stuff. The ranch owner, Pancho Barnes, was an accomplished equestrian and good buds with Chuck Yeager, the World War II flying Ace. He became famous, and chance smiled upon him. Yeager seemed to be in the right place at the right time to be given the opportunity in 1947 to be the first to break the sound barrier. Pancho served him a free steak dinner for his efforts, and as other pilots eventually broke the sound barrier, they also received a free steak dinner at the Happy Bottom Riding Club. It became a thing, beef-for-speed. That was way out there on the left coast, near Muroc (now Edwards) Air Force base in the Mojave Desert. Test pilots and Hollywood celebrities used to hang out there at Pancho’s club, which also had a swimming pool and airstrip. Of course, an airstrip. Pancho was a pilot, too. That happened one day while driving her cousin Dean to his flying lessons—this was in 1928—and she decided she wanted to try it too. Ben Caitlin was the World War I veteran who taught both Pancho and Dean. After only six hours of formal instruction, our heroine took off for her first solo flight. In fact, she was one of the first women to race airplanes because, what could an outdoorsy-type of gal with a hefty inheritance do with her time and talent? Well, she could compete—after all, she had the right stuff. That is, the skill. That four-day-long, all-female air race I have competed in several times, the Air Race Classic, commemorates the women who went against the grain in 1929. When they were denied entry to the National Air Races in Cleveland, Ohio, they made their own race, starting in Santa Monica, California, with the finish line being—you guessed it, at the start of the National Air Races in Cleveland. Pancho was one of twenty women who loved flying so much that they vowed the Women’s Air Derby, as the race was originally called, would begin to change attitudes toward female flyers. It did. She won the race in 1930, smashing Amelia Earhart’s record with a speed of 196.19 miles an hour. The following year, she became a Hollywood stunt pilot and formed the union, Associated Motion Picture Pilots. She promoted flying safety and standardized pay for aerial stunt work. She also flew in several films, including Howard Hughes’ Hells Angels. By the way, her nickname came from her time in Mexico. She disguised herself as a man so as not to be caught by authorities during the revolution there. Her real name was Florence, but the name Pancho really fit her appearance and her personality better. Especially as the CEO of the Happy Bottom Riding Club. Mike: Although David Daniel Kaminsky was the class clown, important things mattered. Since he quit school, he had to find another venue for his love of entertaining. He held a few misfit jobs on his way to the stage, like watching over a dentist’s office during the lunch hour. He was fired when his employer returned to find him using his drill on office woodwork. But the real calling he felt ever since he was just a boy was to make people laugh, to calm their fears, to give them an escape to happiness, if only for a little while. He would change his Jewish name to Danny Kaye, but he refused to get the nose job the studio asked him to have. The success of Danny Kaye is too long a list for this space. Besides being an Academy Award winner, he was a chef, a spokesman for UNICEF, a huge baseball fan, and an avid golfer. That is, until he learned to fly. From that moment on, golf didn’t rank. You can see what made the cut by the carvings on the bench at his grave: a baseball and bat, a piano, a flower pot, musical notes, a chef’s hat, and an airplane. Bill Lear, maker of the infamous Learjet, gave Danny the honorary title of Vice President of Learjet, but told him not to worry about any job responsibilities, like building jets or anything. Maybe Danny’s wife had warned him about what happened to the dentist’s office in Danny’s younger days. She knew. That dentist was her dad. Danny had become a millionaire making people laugh. To calm a nervous, captive crowd after a typhoon hit the hotel he was staying at in Osaka, Japan, he went on stage with a flashlight lighting his face and sang every song he could recall. He gave his best and expected the same out of others—especially his fellow pilots. An old friend of mine was flying for TWA as a first officer on the Boeing 727. On a flight from San Francisco to Los Angeles, the plane was no sooner airborne, gear pulled up into the gear wells, when the captain picked up the mic, and proceeded to give a “tour” of San Francisco from the air. The captain didn’t put the plane on autopilot but was hand-flying it as he pointed out the sights. My old friend kept asking, “Do you want me to fly while you’re doing this?” No, the captain replied. After they arrived in Los Angeles, taxied in and parked at gate, as soon as parking brake on, the captain hopped out of his seat, opened the door and stood at the exit, expecting accolades from his passengers. Good job, Danny. Bloated egos make people do stupid things. Mike: In the mid 1950’s, my Dad worked for Trans World Airlines as a ticket agent in Los Angeles. His favorite airplane was the Lockheed Constellation, and it was one of the airplanes TWA flew. Naturally, TWA was his favorite airline. Following deregulation in 1978, many airlines, TWA included, fell on bad times. All airlines cut services to be competitive, reducing the look-forward-to-travel experience to that of riding in a cattle car. When American Airlines acquired bankrupt TWA’s assets in 2001, my dad had already passed, so, thankfully, he missed that heartache. Much of the airline’s unique classiness was lost as it became homogenized with American. But one piece of its history was left to languish: the TWA Flight Center at New York’s JFK airport. This mid-century terminal building with its saucer-shaped wings, looked every bit like a space travel machine. Through expansive glass windows, patrons were offered panoramic views of the expansive ramp with jets coming from and going to far-off lands. It was the creation of Finnish American architect Eero Saarinen, whom also engineered the arch in St. Louis. Sadly, Mr. Saarinen never saw his futuristic design centerpiece completed, having passed away in 1961, the year before it opened. For nearly forty years, the Flight Center was the most noticeable jewel in TWA’s crown. When people referred to the terminal at JFK, without a doubt they envisioned the TWA landmark with its sweeping stairways and full-length curving balcony. But the building was dumped when TWA was purchased. When the flight center was abandoned, members of the New York Port Authority proposed building new terminal expansions around it. This raised plenty of objections, likening their plan to placing the building in a sarcophagus. Renowned architect Phillip Johnson was outspoken. Their plan, he said, would make the building invisible. “If you're going to strangle a building to death, you might as well tear it down.” Preservationists staved off the wrecking ball until 2005 when the National Park Service listed the iconic structure on the National Register of Historic Places. Some demolition did take place, but the main structure was saved. Behind Jet Blue’s Terminal 5, the old TWA building now has a new lease on life, its two hundred thousand square feet is the foundation of a brand-new hotel. The TWA Flight Center Hotel will open this year with over five hundred modern-but-retro-influenced rooms with amenities reminiscent of the 1960s international traveler style. The front desk and service personnel will wear uniforms that are classic TWA. Eight restaurants and lounges will grace the establishment with every fine detail, including TWA’s logo on menus and room card envelopes. Hotel guests will be welcomed by a restored 1958 Lockheed Super Constellation. Inside, they’ll find a lounge affectionately named, “The Connie.” The generous observation deck and spacious meeting center will evoke the luxury travel style created by TWA during the heyday of the Golden Age of Flying. My dad would have loved it. Mike: Forty-five years of flying, sitting only a few feet from thundering engines and propellers, or in noisy jet cockpits where the air blasted by, has left me with a buzzing in my ears that sounds like cicadas. I have tinnitus. I’m not deaf; it’s a low-volume hum in the background. Soaring soothes my tinnitus. Quiet flight in sailplanes is not silent, as often believed. There is a soft airflow whooshing by the canopy creating a static-like resonance. It masks the little critters chirping in my ears and gives me relief. The whoosh is “white noise.” The full scientific definition of white noise won’t fit here—the length and vocabulary involved remind me of the Youtube video of the guy in the lab coat comically hawking the fictitious “Turbo Encabulator.” He’s trying to sell it to the government, touting its “swerthing bearings” and “use in the manufacture of novatrunions.” Sounds like mumbo-jumbo, just like reading about white noise. My eyes glaze over as I try to understand harmonics. But simply put, white noise is like a radio tuned to an unused frequency. And, it is helpful in treating what I live with—like therapy—it’s relaxing, as it quiets the ringing. Because of its effectiveness on tinnitus, there are many sleep aids that produce white noise. By the way, if you think your house is bugged—possibly by that flat-screen TV—you can purchase a white noise privacy enhancer or a smart phone app that sings white noise. Linda: Speaking of smart phones, wasn’t life a lot quieter without them? Companies are sometimes forced to have their employees leave them outside of meetings to minimize interruptions, so everyone can focus. One popular gas station/convenience store upholds the employee policy to leave their cell phones in their cars. Employees are there to work, not chat. We were recently in a meeting when one person got a phone call and kept the phone on speaker while carrying on a conversation, interrupting the presentation. How many people want to listen to a stranger’s phone conversation? Consider that conversation inside an airliner passenger cabin. Once the aircraft door is closed, they should have that thing on airplane mode, so it won’t interfere with the airplane’s electronics. Many older airplanes lack modern shielding to prevent electron interruptions. That technology wasn’t around twenty years ago. Today’s cell phone conversations can intrude on pilot operations. As airplanes climb, getting further from cell towers, the phone works harder trying to link to the network. The greater power output forces voices to radiate through the shielding. The conversation can pierce into the pilots’ headphones. This interference may happen at a most inopportune time, like when receiving important instructions from air traffic control. The best way to prevent this is to put the phone on airplane mode or turn it off entirely. Mike: That’s good advice that helps pilots. Meanwhile, I’ll keep soaring. The whooshing white noise helps keep the cicadas treed for a while. Linda: When we were discussing what to share with you this week, I thought about the history of the E6B. It was the first flight computer. Not a Mac or PC. More like a slide rule. In fact, that’s where Philip Dalton got the idea for it. Dalton’s first E6B was a circular slide rule that provided the means for calculating true airspeed and altitude. The items necessary for those computations are a clock, a compass and an altimeter. You need to know the temperature, too, because that affects air density, which affects speed and altitude. A later model of Dalton’s gizmo included a wind arc slide. This was printed on an endless cloth belt which moved inside a square box by turning a knob. Fortunately, this is a collector’s item and not the version of E6B used today. The Germans improved on the gadget with what looks more like today’s E6B, a dial and a slide rule together. Line up the numbers right to figure direction, time, distance, speed, altitude, fuel burn, and more. It was his uncle’s and it is now a prize possession of Bruce’s. I was impressed. I went on eBay. You can buy them today, new ones, but there’s nothing like the historical family heirloom that Bruce has. Now if you’re Stuart Marcus, or an ornithologist, you probably already know this is a bird. And maybe you know the story behind it. But we didn’t. It has nothing to do with aviation, really, other than perhaps the story of Icarus or the fact that man builds airplanes so he can fly like a bird. Conclusion: the E6B was the better choice for this week. Linda: Oh, the complexity, the plurality, the many faces of the moniker, "the flying Dutchman." Of course, it may have all started with that myth about the ghost ship, the one nineteenth century composer Richard Wagner wrote about in his opera of the same name. While I generally love Wagner’s music, that opera fell short of my expectations for entertainment. Mike, however, liked it a little better than I did. The opera is based on the legend of a ghost ship that can never make port and is doomed to sail the oceans forever. The myth probably originated from the 17th-century golden age of the Dutch East India Company. Soccer star Robin van Persie plays forward for the Feyenoord team in The Netherlands. He will probably retire this year, going out as possibly the greatest striker of his generation. When you watch him go for a header, he really does look like he’s flying. It’s low-level, of course – even lower than crop dusters – but he sticks his arms out to the sides and sails across the air before skidding back down across the grass. He earned the nickname "the flying Dutchman" doing this. When van Persie was just a babe in grade school, auto racing champion Arie Luyendyck drove his racecar so fast at Indy that everyone said he was the flying Dutchman. He won the 500-mile race twice. And then there’s the seafood restaurant on the Kemah Boardwalk. And the liquor store in Nassau, The Bahamas. The owners of the former like to use the tagline, "It’s not just a story, it’s a local legend," playing on the infamous ghost story. Owners of the latter were fortunate enough to snag the coveted URL, "flyingdutchman.com." It’s hard to get a domain name like that these days. For what it’s worth, not one of the above examples has ever actually flown. Van Persie probably came the closest. However, ladies and gentlemen, it’s girls to the rescue. When nothing makes sense, when you cannot find any so-called flying Dutchman who actually flies, we chicks can sort out the mess once and for all. Her name is Michelle Gooris, and she is "Dutch Pilot Girl." This is the name she chose when she was between jobs and started a YouTube channel. She uploaded a simple video of a solo flight and her channel became a big hit. Since she was reaching so many people, receiving thousands of emails, she decided to use the opportunity to help others reach their dreams of becoming a pilot. 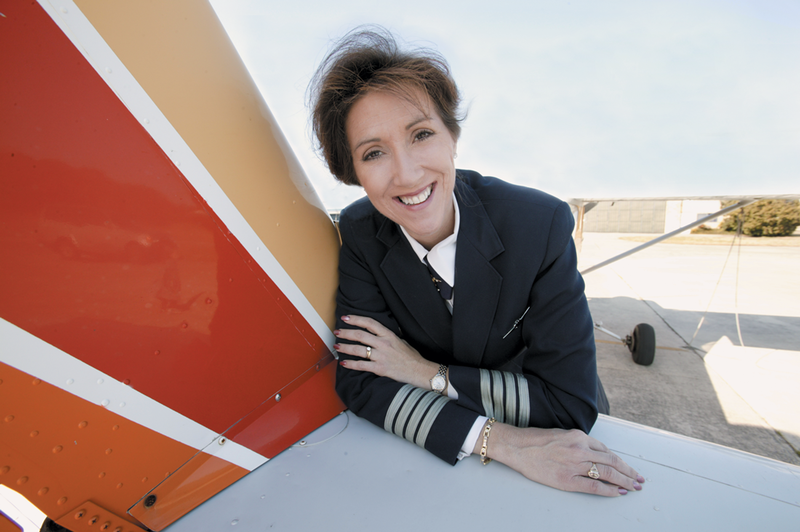 She had learned the keys to achieving goals: responsibility, motivation and perseverance and felt she had something more to say, so she wrote a book titled, "Become an airline pilot." She believes she has become a stronger person because of setbacks in her career, because she’s not one to fade away in a headwind. You can buy her ebook on dutchpilotgirl.com. Finally, a real flying Dutch. Mike: Lately, we have made some pretty long trips. Iceland, Southeast Asia, the Balkan states of former Yugoslavia on the east side of the Adriatic. And we just returned from a journey to Germany, Austria, Switzerland and Liechtenstein. The method Linda uses to find tickets at a reasonable price has served us well. Through our travels, we have discovered a few things. We get up and move about the cabin. We stretch. We lift and lower on our tip-toes. We keep the blood flowing. On long hauls, the flight attendants generally finish up their service duties a couple hours after take-off. That leaves a whole lot of time to get up from our seats and take advantage of open space. Some people do push-ups or full yoga routines in the areas between lavatory and galley or where ever there’s room. Most everyone else sleeps while we exercise to avoid deep vein thrombosis. Here’s another thing: We wonder why nobody wants to look outside. Day or night, nearly all the shades are closed. We cannot understand this strange phenomenon. Part of the enjoyment of flying is the unique views. On forays to far-off lands, the departures from here are usually during daylight. Flying into the night affords unprecedented views of the heavens, the Aurora Borealis over the poles, and lights the shapes of cities far below. Why not compare the map of where you are with a visual sighting of something on the ground and learn a bit about the land? Regarding food, some airlines, no matter how much notice you give them, will never get your special diet request right. Carry extra food just in case. In our experience, Asia-based airlines have an incredible level of service and get it right every time. Our longest flight to date was on Eva Air from Bush Intercontinental to Taipei’s “Hello Kitty” airport lasting nearly sixteen and a half hours. Even with a full aircraft, the crew treated us exceptionally well. They not only got our vegan meals right, they had vegan snacks too. But with the globetrotting capabilities of today’s airliners, it might be best to break things up. Iceland Air offers several days’ stop-over in Iceland on jaunts to Europe at no additional cost. For Far East excursions, Anchorage is a good mid-trip pause. If you have an early morning departure, places such as the Hilton Hotel inside Munich’s terminal make life easier. Staying the night before allowed us to saunter down to the boarding gate without dealing with traffic in a foreign country or dropping off the rental car. And for clearing customs, there is mobilepassport, the smartphone app that has allowed us to stand in a short, twenty-person-deep line instead of with the hundreds stuck in the one that snakes left and right. As we travel, we learn more. Then we take that and use it on the next junket to feed our inner gypsy, because we’re in it for the long haul. Mike: The skies mourned, but downtown Dallas high rises lighted them in colors of Luv last week, paying respect to Southwest Airlines founder, Herb Kelleher. Herb passed away on January 3, leaving a legacy and a ton of friends. Herb was unique, and you’ll hear the sense of loss from his large contingent of friends. He brought a refreshing twist to “CEO,” and the tributes to this “brilliant maverick” are still flowing in. Linda: I remember standing in the jetway with Herb and many others as we waited for Captain Alan Crawford and his family to walk off the plane after Alan’s retirement flight. The jetway was jam-packed, and there was Herb in the midst of it all, celebrating with everyone, ready as ever to encourage and cheer others on. Maybe his secret was that he didn’t seek the spotlight, but that he sought to be the spotlight for others. One thing’s for sure: he lived his life fully, and it was in his nature to be a people-magnet. He didn’t even have to try. And that was reflected in the fun atmosphere on Southwest Airlines flights. As one employee put it, “Where else could you wear shorts to work, dress up at Halloween, tell jokes and sing on the PA system?” She’s right. The first time I heard a joke from a flight attendant aboard a Southwest Airlines flight, I thought, how refreshing – a sense of humor! Here’s to Herbert David Kelleher, who said, “It is my practice to try to understand how valuable something is by trying to imagine myself without it.” He was a valuable man. Linda: At the end of 2017, I found myself facing a deadline. My employer offers a flying stipend we can use for flight training, but it’s a use-it-or-lose-it deal by the end of the year. I hadn’t used it, so we dashed up to Seattle for Thanksgiving week, hoping I could get a seaplane rating. What was I thinking?! Seattle, in the late fall? The ceiling wasn’t high, but it was high enough. The visibility was good enough. But the wind gusted, making waves too strong, beyond the limitations of smaller aircraft. No seaplane flying occurred that week, and I came back home and spent the money refreshing my tailwheel and aerobatic skills. First in a Super Decathlon, then in an Extra 300. Fun, of course, but I still didn’t have a seaplane rating. Then came December 1, 2018 and I found myself in the same position, not having done any new training. This time, however, I wised up and chose Southern Seaplane in New Orleans, where the weather might be better than in Seattle. I lucked out and started my training with Nate, a young man the older guys referred to as "the prodigy." I understood why right away. Great instructor. He followed all the rules of good, sound teaching. The minimum requirements are two hours of training with the same instructor followed by a one-hour proficiency flight with a different instructor. I flew with Michael for the proficiency flight. Of course, you can take longer if needed, but I found the instruction to be of such high quality that I didn’t need more than the minimum required. After three hours in the Cessna 172 on floats, I met with the FAA Designated Pilot Examiner, Lyle Panepinto. We sat down for the oral exam I had studied for, then went out to the plane for the check ride. I was required to show him I knew how to perform various types of taxiing in water, then off we flew, following a channel away from New Orleans, then over the Intercoastal Waterway for some splash-and-go’s. Part of the test required that I prove I can land the floatplane in a specific spot, then under different conditions. The spot landing went well, so I went on to show Lyle my landings and take-offs in glassy water, rough water, confined space. Because the way water behaves has a significant effect on a float plane, each of these requires a different method to accomplish. I returned to the base a happy new commercial seaplane pilot. As we secured the airplane to the dock, Lyle informed me that those who fly in Alaska don’t consider pilots flying in the Gulf to be seaplane pilots. "You’re now officially a Louisiana Ditch Pilot," he affirmed. He didn’t even charge me extra for the pure enjoyment of listening to his thick Cajun accent. I already miss landing on water. It’s a different skill, not necessarily harder, just loads of fun. Linda: Trend-setting vacuum cleaner king, David Oreck, and his wife Jan were the subject of our stories the past couple of weeks. We’re sharing just a bit more on this aviation-loving couple, because Jan had more she wanted you to know. For starters, she advises that, "If you make your local airport a destination, people will come. People of all ages look for things to do close to home – but especially older folks – where they feel welcome and included." We and all others who have experienced the unique world of flying know this, that the health of an airport is directly tied to the health of a community. For instance, the Louisiana Regional airport hosts a "Second Saturday Fly-in" fish fry, and people from the area come, too. And as Jan and others have pointed out, we need more young people in aviation. One thing that helps is when airports look and feel inviting. Barbed wire fences and signs that wreak of unwelcome don’t further the healthy goal. What if you were interested in a new adventure and were met with such a sight? So, take it from a remarkably self-made successful business man and the woman who has been at his side – airports are vital to a community’s well-being. Jan was chatting with me from their Mississippi home on six hundred acres, with a one hundred-acre lake, where their hospitality is well known. David still has his fleet of airplanes, and he still goes to work every day in a building they own which used to be a federal reserve bank, built in 1923. David says it was built in honor of the year of his birth. That’s when Jan gives him "that look." Perhaps, it was forecasting his success. She also shared this thought to ponder. David had been in the military during World War II, serving as a navigator on B-29s. Many years later the Orecks received a call from a man named Mark who wanted to know more about his own father. He had learned his dad served with David, so he hoped for stories that would fill in the gaps about things he didn’t know. As Jan sat and listened, she considered the irony, the unknown, and all the twists and turns life takes. She heard David tell Mark of the dangers he faced navigating bombers in war. There were many casualties aboard B-29s shot down. Survivors have wondered why them – when the odds are uncomfortably high, why did one guy make it home, and not another? "What if," as Jan has often contemplated, "their plane had gone down – the one David and Mark’s dad were on?" The world would have been a different place. Thankfully, both survived the war so that today we have Oreck vacuums and we all enjoyed cheering for Olympic Gold Medalist swimmer Mark Spitz fifty years ago, because his dad and David made it through on a B-29. One second can make a difference. So can one life. Here’s to a happy, prosperous 2019. Pilot, veteran, entrepreneur, lecturer, and philanthropist David Oreck made an appearance in this space last week. Now you’ll meet his lovely pilot wife, Jan. They met on a blind date forty-two years ago. David had a Cessna 421 and when Jan flew with him, she often asked questions. After they married, he brought home an airplane for her – a Super Decathlon. She was a bit overwhelmed at first. "I appreciated the gift, I mean, what a surprise, an airplane! But I told David there was just one problem: I didn’t know how to fly. He immediately answered, ‘You’ll learn.’ Then I had that fleeting thought of self-doubt and I asked him, what if I can’t do it? What if I can’t fly this plane? When he said, ‘Then I will,’ that took all the pressure off me, and I was ready to give it a try." Jan trained every day during the week out of Lakefront airport in New Orleans. When it was time to solo, her instructor, Al, hopped out of the plane and said, "Take it up, three times around, a full stop landing each time." Many, if not most students don’t feel ready to solo when the instructor knows they can do it. Jan started to say, "Wait!" but it was no use. Al was out, portable aviation radio in hand, waving her on. All her training had been done on Runway 18-36, which is oriented north-south, so when the tower controller sent her to Runway 9, the east runway, she had to do a mental reboot and figure out where to taxi. "The first time around," she says, "I was nowhere near landing in first third of the runway. I heard Al’s voice in my head: ‘If you can’t land in the first third, go around.’ The second time, I landed." Then the controller told her to land on a different runway, which she suspects was Al’s idea. "I handled it. But that took a lot of moxie," she laughed. Jan loved the early challenges of learning flight planning, finding an airport, and flying. She earned her private pilot certificate within a few months. "These days," she says, "I’ll go from our farm in Mississippi to lunch in Gulf Shores because I can. I’m happy putting around in my girl." The Orecks have hosted fly-ins at their farm the first weekend of November to commemorate the founding of the women’s pilot organization, the Ninety-Nines. "We have a ‘Top Gun’ theme and everyone wears flight suits. We’ve turned it into our own version of ‘Rocky Horror Picture Show.’ We sing and have a wacky time." But she’s quick to point out that flying is so much more than going somewhere. Many of her friends flew supplies into Houston and Beaumont after Harvey. After Katrina, Jan was able to take off from her grass runway to see if there was a way out for people who were trapped. "Flying is very serious, but when we’re done, we jump out and shout ‘Wahoo!’"